Beginning this month, Team Radio, in conjunction with Ponca City Public Schools, begins the “Wildcat of the Week” program. 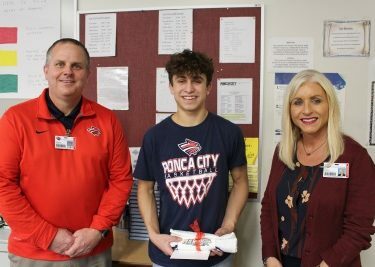 The first Wildcat of the Week recipient, presented by Heather Cannon Honda, is Justin Thompson, a sophomore at Ponca City High School. Justin constantly exhibits the characteristics of the Wildcat Way in all aspects of life. He is driven when it comes to Work Ethic, Improvement, Leadership, Discipline, Competition, Attitude, and Teamwork. Justin was presented a Wildcat of the Week T-shirt from Boss Custom Tees, a Wildcat window decal, and a burger basket gift certificate from Ground Round by Thad Dilbeck, Po-Hi Principal, and Shelley Arrott, Ponca City Public Schools Superintendent. Thank you to Senator Bill Coleman with TEAM Radio, Tyndall Dentistry, Heather Cannon Honda, Ground Round, and Tina Christian for supporting the Ponca City High School Wildcat of the Week Award. Listeners and viewers are urged to nominate a Po Hi student as the “Wildcat of the Week.” Each student nominated should follow the ideals of the “Wildcat Way.” To make a nomination, follow this link: Wildcat of the Week Nomination Form.